El chiquito al que usted rompió el brazo le dio una cuchillada. A mí de pronto se me escapó el brazo y le di otra. The kid whose arm you broke cut him with his knife. Then my arm got away from me and I knifed him, too. The kid whose arm you broke cut him with his knife. Then my arm escaped itself on me and I knifed him, too. The se accidental construction combines a reflexive verb (se escapó) with an indirect object pronoun (me). 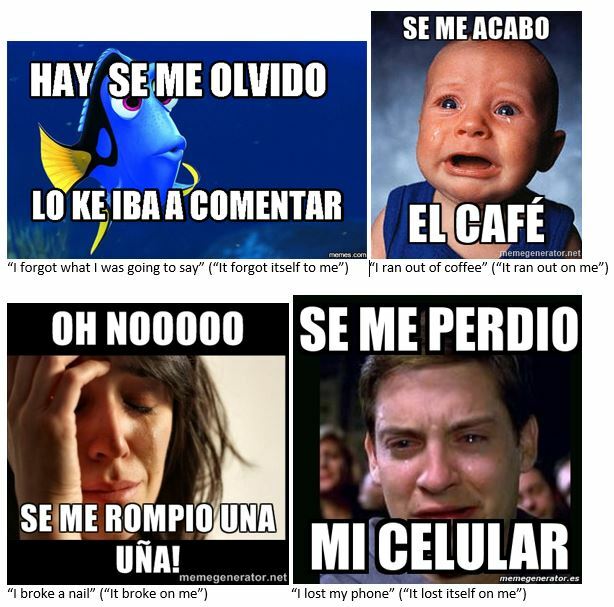 Se me escapó is an excellent example of how Spanish speakers use this construction to deflect blame. The murderer didn’t raise his arm to attack the victim: it was the arm itself that sprang into action. In most cases, though, the se accidental is used to describe genuine accidents. This usage is common enough to have become an Internet meme; some cute examples are shown below, along with their expressive and literal translations. 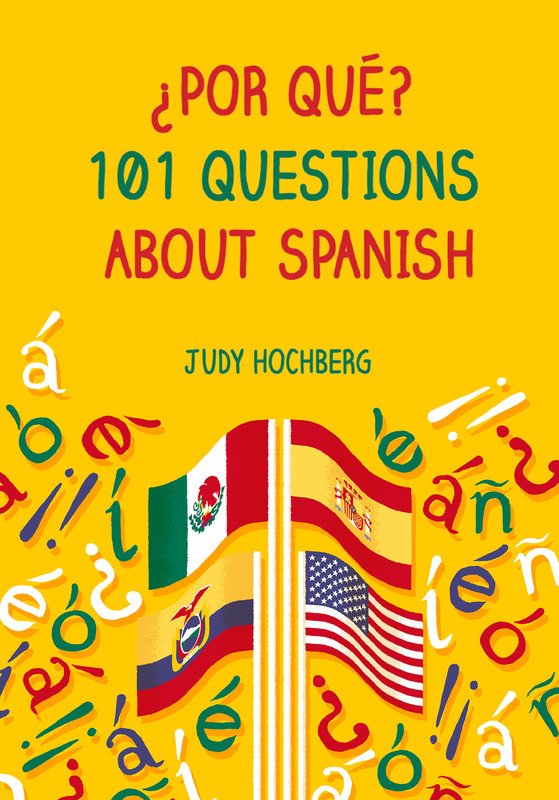 The se accidental is linguistically significant because it is has been shown to affect the way that Spanish speakers perceive events. As you can see in the meme examples, the construction shifts attention away from the person who is responsible for an accidental event. A clever study by Caitlin Fausey and Lera Boroditsky showed that Spanish speakers were therefore less likely than speakers of English to remember who caused an accident. Similar results have been found for speakers of Japanese, which has a similar structure. The se accidental is thus a lovely example of “linguistic relativity”, the linguistic term for language differences that affect the way people think. Another common term for linguistic relativity is the “Sapir-Whorf hypothesis”, after the two linguists Edward Sapir and Benjamin Lee Whorf. The latter is notorious in linguistic circles for having spawned the now thoroughly-debunked linguistic legend that Eskimo languages have an outsize number of words for snow. Linguistic relativity recently went to Hollywood, playing a major role in the movie Arrival. In this film a linguist (Amy Adams) pairs with a physicist (Jeremy Renner) to decipher an alien language, and finds that this process drastically changes the way she understands the world. The se accidental isn’t quite as dramatic as Adams’ new-found ability to predict the future, but it’s certainly more realistic. By the way, my husband and I got a special kick out of Arrival because I am a linguist (like Adams’s character) and he is a former Los Alamos physicist (like Renner’s). We actually know several other linguist/physicist couples. Perhaps linguists and physicists attract each other because both fields apply scientific thinking to everyday domains. This could be the subject of yet another research project! This entry was posted in Uncategorized, Verbs and tagged Arrival, Benjamin Lee Whorf, Edward Sapir, Eskimo words for snow, Lera Boroditsky, linguistic relativity, Manual Vázquez Montalbán, Pepe Carvalho, Sapir-Whorf, se accidental on 25 March, 2017 by jhochberg.